Get a move on, people! Why? Because now you don’t have an excuse to eat bad on the run! I’m providing you with a delicious and unique recipe that you can simply toss in your bag and eat on the go! We are all busy, yes, but that’s no excuse to grab fast food on the run that can simply destroy that amazing physique that you have worked so hard for in the gym! You can still eat healthy, despite your many obligations; all it takes is a little preparation. 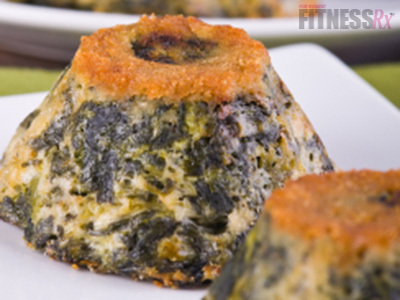 Today I’m bringing you an easy, mouth-watering recipe that you won’t soon forget: Upside Down Spinach Cakes! That’s right…a perfect meal/snack in a muffin-like cake! The fluffy egg whites combined with the creamy yogurt and ricotta cheese, and the hearty cream of rice, all seasoned perfectly with a blend of spices and veggies provide a satisfying treat that will turn you upside down! Share with your family and friends…or freeze for leftovers; they are just as amazing once defrosted! What’s even better? They have fewer than 150 calories per cake!